Do you like palm trees? Well you’re in luck if you plan on visiting, buying or renting a villa in the Hondon Valley area, Costa Blanca South... because you can visit Elche, the City of Palms, near Alicante. 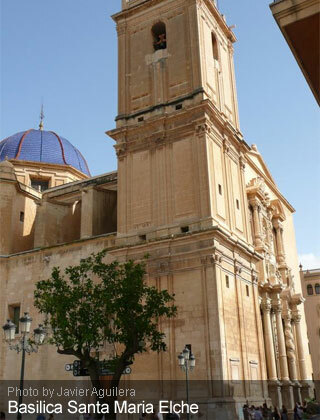 Located in the Costa Blanca South, Elche is known as the World Capital of Palm Trees. And for good reason too: there are more than 11,000 palms trees in the city with some specimens being as old as 300. The Palmeral of Elche was inscribed on the World Heritage list in 2000 ‘representing a remarkable example of the transference of a characteristic landscape from one culture and continent to another’. Here you will be able to see the influence left on Europe by Northern Africa during the Islamic occupation and how it is still manifesting itself to this day. Elche is also culturally recognised in the Mystery of Elche, a re-enactment of the Virgin Mary’s life which is celebrated on the 14th and 15th of August every year which is well worth the visit which also ends with the most amazing Fireworks Display (has to be seen to be believed). Commemorating the death and ascendance of the Virgin Mary to heaven, the drama dating back to the Middle Ages has been declared one of the Masterpieces of the Oral and Intangible Heritage of Humanity in 2001. Receiving the opportunity to see such a significant piece of mankind’s history is truly breath-taking and something that you will remember for the rest of your life. Also in the city, La Calahorra can be found, a fortress which dates back to the 7th century. Used for Egyptian rituals, you will be able to see what they used in these rituals and how they lived in an impressive look into the past. Along the shoreline you will find twelve kilometres of sandy, white beaches, long enough for you to find a secluded, quiet sport where you can relax and stare out into beautiful blue ocean. AUTHOR: Written by Alex Corcoran, passionate traveller and blogging addict. Click here to see some of her holiday breaks ideas. The local Real Estate Agent in the Hondon de los Frailes and Hondon de las Nieves for property sales, rentals and real estate services. Buy, Sell or Rent!